PHILADELPHIA & MANITOWOC, Wis.--(BUSINESS WIRE)--Orion Energy Systems (NASDAQ: OESX) (Orion Lighting), a leading designer and manufacturer of high performance, energy-efficient LED retrofit lighting products, unveiled four new LED lighting products at the LIGHTFAIR® International Trade Show and Conference (booth #401) at the Pennsylvania Convention Center in Philadelphia, PA. The industry leading products deliver significantly more energy savings than comparable products on the market and are designed to serve as a connected lighting platform that delivers business solutions beyond energy savings and lighting performance. In addition to the four new products Orion is launching exclusively at LIGHTFAIR 2017, the company will showcase a wide array of the state-of-the-art LED lighting products it has released over the past year. The New ISON LED LDR® Retrofit Modular Gourmet with Britex™ delivers business solutions to the foodservice industry. Designed to easily integrate with smart controls, the high-performance luminaire has the power to elevate guest and staff experiences, improve food safety, and enhance the appearance of food products with a variety of light levels and color temperatures. First to market, patented LED troffer retrofit featuring Britex, Orion’s proprietary white coating with antimicrobial properties designed to suppress the growth and transmission of microorganisms in food display and preparation applications. Designed to retrofit existing 2’x2’ and 2’x4’ door frame fluorescent troffers. Enables installation in under two minutes with minimal workplace disruption. Compatible with multiple commercially available control technologies; can serve as a platform to deliver business solutions through digital ceiling and IoT initiatives. Backed by the ISON 10-year warranty. The New APOLLO Generation III LED High Bay is designed for industrial, commercial, and retail applications – both high bay and low bay. At 165 lumens per watt, the Apollo Gen III is the highest performing luminaire in its class. Consumes approximately 26 percent less energy than the average comparable LED fixture in the same luminaire category. Exceeds the lumens per watt efficiency of the APOLLO Generation II LED High Bay by almost 10 percent. The future-proof, modular design reduces costs by allowing maintenance crews to easily keep pace as technology evolves, light level requirements change, or to improve efficiency using the luminaire’s existing platform. Options include lenses, emergency fixture colored end caps and battery backup. The New APOLLO LED High Lumen High Bay and High Bay Plus are designed to provide powerful high bay or low bay illumination for industrial, warehouse, manufacturing, commercial, wholesale, and retail applications. Delivers industry leading lumens per watt efficiency of up to 163 LPW. Innovative thermal design reduces the operating temperature. Less heat means the luminaire performs more efficiently, extending its rated life and boosting performance. Offers five lumen packages of up to 55,000 lumens. The New HARRIS Generation II LED High Bay is ideal for industrial, commercial, and retail customers seeking a cost-effective solution to deliver energy savings and maintenance reductions over traditional linear fluorescent high bay lighting systems. The 2’x2’ high bay delivers up to 140 lumens per watt. 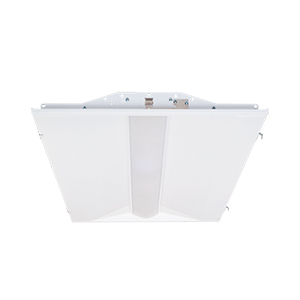 The lightweight, white aluminum body offers light distribution options for aisles or open areas. Options include lenses and battery backup. For a complete list of the features and benefits of Orion’s newly launched products, visit orionlighting.com. LIGHTFAIR® International is the world’s largest annual architectural and commercial lighting trade show and conference and is sponsored by the International Association of Lighting Designers (IALD) and the Illuminating Engineering Society (IES). 1. Based on replacing 1,000 3-lamp T8 troffer fixtures consuming 88 watts with Orion’s ISON LED LDR Troffer Retrofit Modular Gourmet fixtures consuming 102 watts, operating 6,000 hours per year at an electric rate of $0.11. 2. Based on replacing 1,000 6-lamp T8 high bay fixtures consuming 221 watts with Orion’s APOLLO LED High Bay, Generation III fixtures consuming 102 watts, operating 6,000 hours per year at an electric rate of $0.11. 3. Based on replacing 1,000 6-lamp T8 high bay fixtures consuming 221 watts with Orion’s APOLLO LED High Bay Plus fixtures consuming 139 watts, operating 6,000 hours per year at an electric rate of $0.11. 4. Based on replacing 1,000 6-lamp T8 high bay fixtures consuming 221 watts with Orion’s HARRIS LED High Bay Generation II fixtures consuming 121 watts, operating 6,000 hours per year at an electric rate of $0.11. Orion is a leading designer and producer of energy efficient lighting and retrofit lighting solutions for commercial and industrial buildings. Orion manufactures and markets connected lighting systems encompassing LED solid-state lighting and smart controls. Orion systems incorporate patented design elements that deliver significant energy, efficiency, optical, and thermal performance that drive financial, environmental, and work-space benefits for a wide variety of customers, including nearly 40 percent of the Fortune 500.